In two separate but similar cases this week, the Supreme Court has handed President Donald Trump a setback on immigration and a victory on transgender troops. 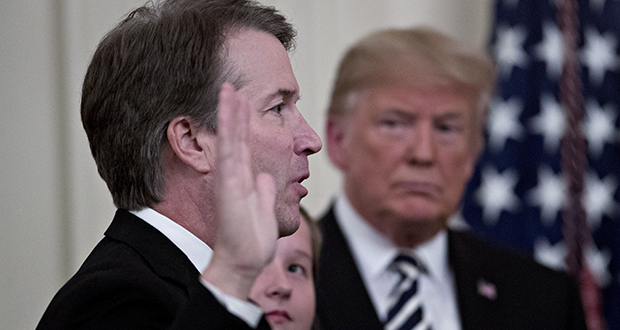 In particular, the court’s actions show that its newest member, Justice Brett Kavanaugh, may not be prepared to give the president what he wants. Before reading the tea leaves, however, it’s important to understand what the court actually did. It chose to leave the Deferred Action for Childhood Arrivals program in place for now, meaning that it won’t hear a case about it before October 2019, and probably a good deal later. This decision — or really non-decision — is a setback for Trump, who tried to rescind DACA, which protects hundreds of thousands of undocumented immigrants from being deported. His plan was blocked by a federal district court. Here’s where the details start to matter. It is almost impossible to imagine that Justices Clarence Thomas, Samuel Alito, and Neil Gorsuch are unsure about whether Trump can rescind DACA, which Barack Obama put in place by executive order. Logically, they should have been prepared to vote to allow DACA to be rescinded while the case is litigated. Another detail: Had Kavanaugh but not Roberts wanted to hear the case immediately, his vote would have been sufficient in conjunction with the three hardline conservatives, since it only takes four votes for the justices to agree to hear a case. The reasonable conclusion, therefore, is that Kavanaugh didn’t want to rush the DACA case — and that he didn’t want to allow Trump’s DACA rescission to take effect right away. All of which means that, for now at least, Donald Trump has good reason to be annoyed with Brett Kavanaugh.